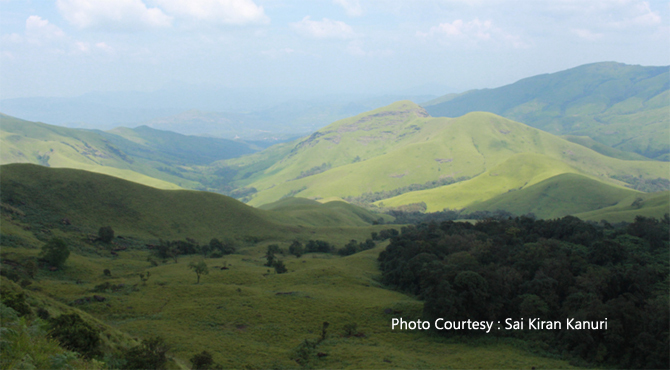 The Kudremukh or Horse Face Range is situated 95 Kms southwest of Chickmagalur town. The broad hills which overlook the Arabian Sea are chained to one another with deep valleys and steep precipices and is so named because of the unique shape of the Kudremukh peak which has the highest elevation at 1892 metres. The park named after the peak, extends over three districts, Dakshin Kannada (South Kanara), Chickmaglur and parts of Udupi and stretches between Narasimha Parvatha (in Sringeri Taluk) in the north to the Jamalabad Fort (in Belthangady Taluk) in the south. The park is divided into four ranges Kudremukh, Kerekatte, Kalsa, Shimoga. The park with an area of 600.32 sq.kms is 1,894.3 meters above sea level and is rich in iron ore deposits. Country’s largest iron ore mining company, Kudremukh Iron Ore Company (KIOCL) is situated within the park area. The park is cool and salubrious round the year, but during monsoon from June to September, there is heavy rainfall. 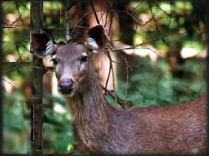 The best time to visit the park is immediately after the monsoon ie, October to May when the forests are lush green. To watch the wild animals best time to visit is between December and February. There is a wide variety of flora and fauna in the park. The park is covered with thick hilly forests, mostly evergreen and semi-evergreen near the coastal plains on the western portion; and the shoal–grassland habitat at elevations above 1400m on the Western Ghats. Plantations of Eucalyptus, Casuarina, Acacia auriculiformis and Grevillea robusta are found here. The park is surrounded by Coffee and Tea plantations on the northern and eastern boundaries. The wild animals seen in the park include tiger, leopard, wild dog, jackal, lion-tailed macaque, common langur, sloth bear, gaur, sambar, spotted deer, barking deer, Malabar giant squirrel, giant flying squirrel, porcupine and the mongoose. The park is particularly rich in the diversity of birds. Approximately 195 types of birds are found in the park. This includes rare birds like the Malabar trogon, great pied hornbill, Malabar whistling thrush and the imperial pigeon. Trekking is another interesting thing can be done in Kudremukh. One has to obtain an entry permit for trekking inside the park from the Range Officers or Deputy Conservator of Forests. The whole scenery of lush green grassland interspersed with narrow strips of forests rivers, cascades, variety of flora and fauna, caves, ruins and traces of old civilizations provide a fantastic vista for a trekker. There are 13 trekking routes inside the park and the anti - poaching camps (APC) on the way are useful as camping sites. The Bhagavathi Nature Camp located along the state highway, also forms an excellent camping site with tented cottages and dormitory. Ganga Moola, the source of several rivers including Bhadra, located inside the park is a scenic spot in the Bhagawathi Forest for trekkers. The Kadambi falls and the Lakya Dam located near the Kudremukh project area is another interesting spot in the Kudremukh range. The park is quite rich in water resources. The famous Tunga, Bhadra and Netravati rivers flows through the park. Apart from these, there are numerous seasonal streams. The Park also has in its vicinity pilgrimage centers like Sringeri, Ganga Moola and Annapurneshwari Temple, which makes this place a favorite among tourists.